What a beautiful day to enjoy some cookies and tea by my little waterfall. Won't you join me? My granddaughter Cissy and I made these. I'm using my Jonson Brothers Friendly Village Springtime plate and a Lenox teacup that Debbie gave me, from She Graces Her Home In God's Beauty. Here is Cissy with all her Chocolate Crinkle Cookies ready to go into the oven. Isn't she such a cute little baker? I bought this sweet cherub from HomeGoods, but first talked myself out of it, went home and decided to go back the next day. Hooray!! It was still there and I decided to purchase it. It looks so pretty next to my waterfall, doesn't it? Behind the cherub is my oak leaf hydrangea plant that my youngest son planted for me last year. Isn't it a beauty? Supposedly this plant does well in Texas. This is some happy news that I received recently! Cissy rated this cookie a 5-Star! Preheat oven to 350 degrees. Line two cookie sheets with parchment paper. Put the powdered sugar in a medium bowl and set aside. In a medium bowl, whisk together the flour, cocoa, baking powder and salt. In a large bowl, using an electric mixer, beat the butter and sugar on medium speed until fluffy and pale, about three minutes. Turn off the mixer and scrape down the sides. Add 1 egg and beat until blended. Add the other egg and the vanilla and beat until blended. Turn off the mixer and add the flour mixture. Mix on low speed just until blended. Scrape down the bowl. Scoop up a rounded tablespoonfuls of dough and roll into a balls. Roll the balls of dough in the powdered sugar until completely covered. Place the balls on the prepared cookie sheets, spacing them 2" apart. Bake the cookies 1 sheet at a time until crackled and puffed, 10-12 minutes. Remove the cookie sheet from the oven and place on a wire rack. Let cool for 15 minutes, then use a metal spatula to move the cookies directly to the wire rack. Let cool completely. 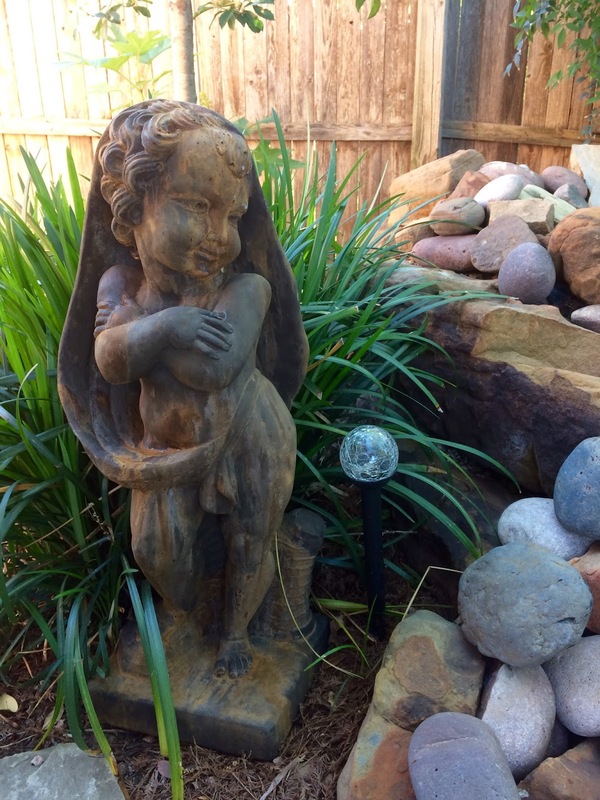 Your sweet cherub was meant to live with you, and looks so pretty next to your waterfall. Cissy is the cutest baker ever, and those cookies sound wonderful. I wish you could join me on a drive to the sugar shacks. I meet the nicest people and they would love you! Hope your trip to Arkansas was wonderful. Congratulations on your expected October grandchild! 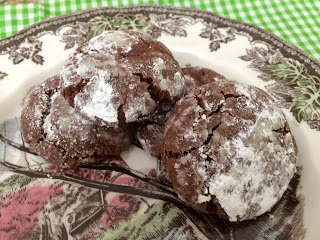 I remember the first time I made Chocolate Crinkle Cookies--fell in love with that glorious chocolate taste. Your garden is just gorgeous and I love you bake with your granddaughter! Cissy is such a cutie and I'm sure a wonderful helper. Congrats on your exciting news. The chocolate cookies sounds very similar to my Mom's recipe that we call chocolate snowballs. They're my son's favorite at Christmas time.Happy week, Kitty! I Love your cherub! I have one too for my garden. The cookies that you and your granddaughter made looks so good. Congrats on the exciting news. Thanks for sharing your recipe with us at C&C with J&J. Enjoy the week. I have not made those cookies since my kids were little!! I do remember them from years ago and had forgotten about them. My oldest gd is a real baker and she will love making these. I'm glad the cherub was still there when you went back, especially after you thought it over. It looks it's been there forever. Congratulations on your new grandbaby. What a sweet way to spread the news. Congratulations Grandma...a new wee one to join the gang when you teach in the kitchen!! How fun! I've been making those choc. crinkle cookies since the 70's...always a big hit. Love your garden and your cookies look so delicious!Congratulations on your new grandbaby!Your princesses are always so cute!Hugs. Congratulations on another sweet grandbaby. October the same month my Genevieve was born. So sweet. Cissy has some fine looking cookies there and I am afraid if I was around there would be a lot less than 20. They look sooooo goood! She is an adorable cook and such a happy smile she is wearing. Oh my, those cookies look so yummy. Cissy is adorable... Love her big smile. Congratulations again grandma.. The family keeps growing.. So much fun. Cissy is absolutely adorable. She loves baking with you! These cookies look very yummy. I must try them. What a cute reveal! Congrats on the impending arrival of your new grandchild. Looks like Cissy is ready to join the Junior Bakeoff shows! I'm glad that the cute cherub was still available at the store. I've lost count how many times I didn't buy something and regretted it! You have the most adorable helpers in every post, Kitty! I am sure those cookies are so delicious too...and how wonderful...a new grand baby is coming! Congratulations! Kitty, oh my ~ cookies are my kryptonite. They are my weakness but I don't mind being weak when it comes to cookies! Congratulations on the new grand baby! So exciting!!! PS Did you make the Berried Treasure Pie? Did everyone like it? Kitty, first of all, congrats on the news of growing your grands! That'll be something fun to look forward to and plan for. Yes, Cissy is most definitely your cutey assistant. You two must have so much fun together, and she is learning so many life skills being with you! I have that statue in my garden (plus 3 more) - he represents the season of winter. They're each a little different and look great in the landscape. 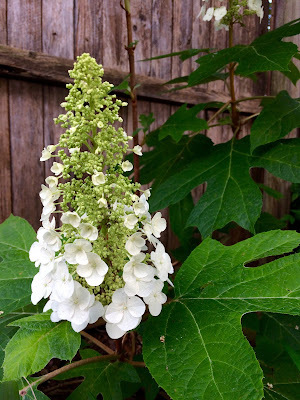 I love your oakleaf hydrangea. My next door neighbor has one, and I love how they turn from that white/chartreuse to a mauvy pink - they've got great seasonal interest. Enjoy! How exciting! 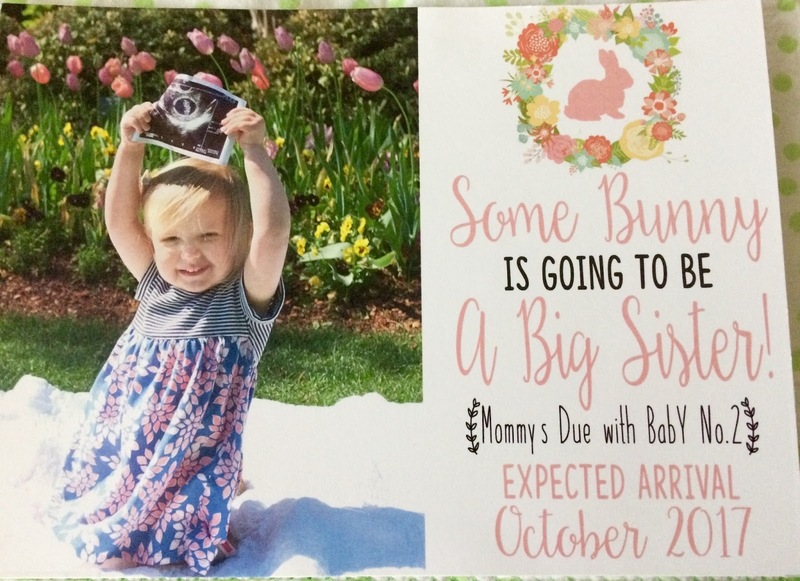 Congratulation on the soon-to-be new grandbaby! I'm still waiting lol . . . I love these cookies but mine NEVER crinkle! I'll have to try your recipe and see if they do. I always say that if I'm 'on the fence' about buying something and I wait AND it's still there and I'm STILL thinking about it . . . it's meant to be! I have never seen a hydrangea like that one -- SO pretty! Hope you're enjoying a sunny, warm spring day! We are supposed to be near 80 today! Woo-Hoo!! Hi Kitty, your sweet grand is adorable and such a wonderful little baker too. Congrats on the new baby on the way. What a blessing! The outside setting is so peaceful by your beautiful waterfall. Perfect to enjoy tea and the pretty day. Love the beautiful angel you added to the area. Glad you went back for it. Your hydrangea is gorgeous!! Thanks for sharing the cookie recipe. They look delicious. What a DARLING picture of your little granddaughter at the end of this post -- she's adorable!! Congratulations on the good news! Cissy certainly is a cute little baker, and those cookies look wonderful (of course I've already pinned the recipe). Thank you for sharing with us. Your little waterfall area is so pretty, and I'm glad you went back to HomeGoods for the cherub. It looks PERFECT in your garden. Your begonia is really pretty, too. I hope you have a great week, Kitty!! Another sweet day of nana's baking school with yummy cookies for tea. How exciting to have another grand on the way! I too have an oak leaf hydrangea but it is having a hard time to get going because the rabbits eat it back over winter. I did manage one flower last year. Interesting to know it grows well in your Texas summer heat. Kitty, your little baker is a sweetie. Chocolate crinkles are the very best. So glad you went back and bought the cherub. I think we have all done that. Sometimes we lose. Have a wonderful week. Your photos are great! Your granddaughter looks like she is having so much fun! Congratulations on the new baby on the way! Ohh...your cookies look delicious! Must have been because of your helper, I am sure! Congratulations on your good news! Your garden looks lovely! Too cool for tea outside here yet. Have a wonderful week! Your cookies look and sound wonderful... and tea with such cookies, by the waterfall, sounds even better! :) I hope you have a great week. Happy day to you, dearest Kitty. Love and hugs! This cookies look delicious and I had to pin them. Congrats Kitty! Another future baker for Kitty's Cooking Camp!! Your Cissy is adorable and she bakes a very tempting cookie! Kitty, love your little baker! And I'm so happy for your news of another prospect for Nana's Cooking Camp! Your cookies look delicious, and it's high time I made something chocolate for Mr Delightful. You shared TWO cherubs in this post today, my dear friend - the one you bought (yay so glad it was still there,) and that darling angel-baker-grand-cutie Cissy! What a sweet smile she has. She sure is growing fast. 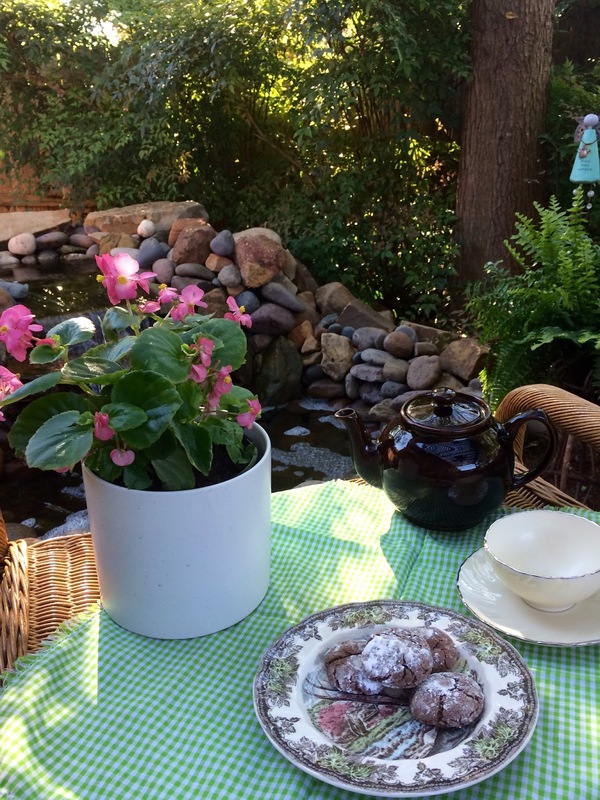 Those cookies - along with your garden delights and lovely gifted teacup from sweet lovely Debby is just perfect. What great news! The very best news! I love chocolate crinkle cookies and would love to sit beside your water feature and enjoy a visit with you, Kitty. I actually think Sissy has grown recently. She looks older. Sweet Johnson Brothers pattern and fun tea cup exchange. Yummy cookies and cute chef Kitty! My friend has a gorgeous Oakleaf Hydrangea. I would love to plant one. Congrats on a new grand to be!! Thanks for sharing with SYC. How wonderful that your precious cherub was waiting for you, she looks perfect by the waterfall. It's always a joy when we rethink purchasing something and it's still waiting for us. I love these cookies you are sharing with us!! My oldest daughter introduced them to me years ago. Your granddaughter has the sweetest smile. I remember so well gifting you that tea cup through Stephanie's exchange. You, my dear friend, were such a delight to share with and then to become friends with. God's goodness for sure. It always impresses me how you can turn a cookie into a party. Your granddaughter is turning into quite a cook. Good morning, Kitty...what a cutie pie you have baking cookies. Her smile is so sweet....and the cookies sound delicious. We are doing better here. Congratulations on the exciting news of another Grand on the way! Your little waterfall feature makes such a delightful backdrop here. 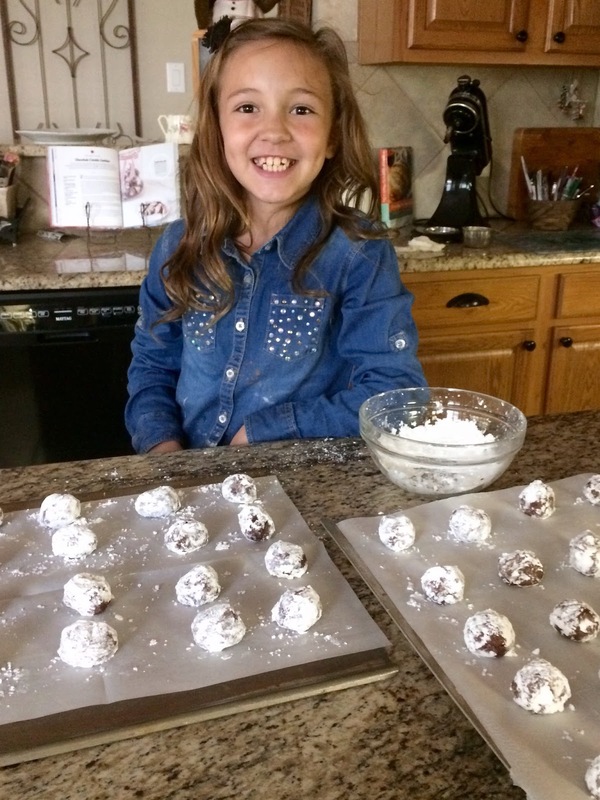 This little gal is becoming quite the Pastry Chef too! Yumm! I love that you do such special things with your grandchildren! Recipe looks yummy! Thank you for sharing at Dishing It & Digging It! You two ladies are sure having a good time and making delicious cookies! Thanks so much for sharing with us at Full Plate Thursday and have a great week.